The Wits Football team make history by defeating NWU for the first time. 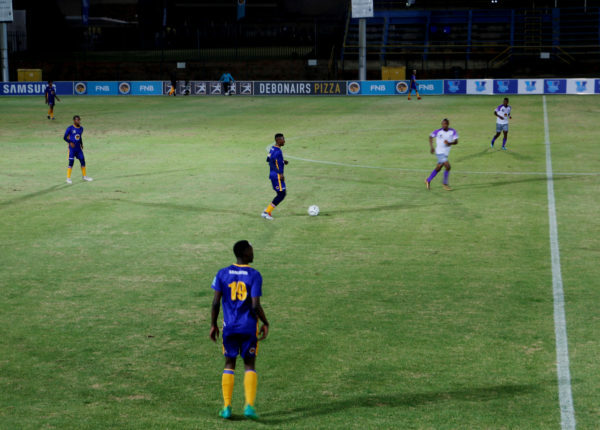 The Wits team came out victorious in their Varsity Football against NWU (Northwest University), with a at the Bidvest Stadium on Thursday, August 23. The 2-1 win has allowed Wits to secure a semi-final spot in the Varsity Football competition. NWU were a tough side dominating the first half of the game with an attacking style of play. Mogomotsi Molefe put the visitors from Mafikeng in front by opening the scoring a merely three minutes into the game. Despite the pressure, the Wits boys held their own and made a strong comeback in the second half. Wits were not short on attempts at goal but the win eventually came through goals of Wits captain, Tsiriletso Motsogi and Mahle Mtabane. Motsogi, also the man of the match, showed his ability to lead by example when he managed to score the equaliser in the 50th minute. “We knew that this was not gonna be an easy game because Mafikeng lost its previous match, we knew that they wanted a win. We also have not won the previous two games so we had to get back to our winning ways,” said Motsogi. Wits assistant coach, Alzavian van Rheede, was proud of his boys’ performance, especially since this was their first win over the side from Mafikeng. “You could see Mafikeng was coming here for a point. Another stumbling block in our minds is that we have never beaten Mafikeng. We’ve always been the whipping boys and I am happy that the players stepped up and they did well,” he said. Wits fan came out in their numbers and cheered with support. “What I liked about the boys is that they have character, they were 1-0 down during the first half but they came back and performed. The supporters also helped them gain morale,” said Siyanda Mkhwanazi, a Wits Accountancy honours student. Bongumusa Masikane, a Wits Architecture alumnus, was also impressed that the boys overcame their first-half hardships. “The little things let them down tactically in the first half but I am happy about how they have come back from conceding a goal early,” he said. Wits’ fight to get to the number one spot continues as they take on the University of Limpopo in an upcoming match next Thursday, August 31. Wits Vuvuzela: Wits Football on a winning streak, August 2018. Wits Vuvuzela: Wits Sports welcomes a new manager, August 2018.